The children’s market is booming in the Martial Arts industry. It is becoming a very popular activity, particularly with children that have some degree of ADD. The problem is that roughly 10 to 20% of children with ADD or ADHD do not have the necessary listening skills to participate in group classes such as the Martial Arts. However, it is very difficult for martial arts professionals to make that decision when new prospects walk through the door. With that said, we recommend that you pre-evaluate each child’s skills to determine which program he or she will qualify for. This way you can place the student into the program that best fits his or her needs. This helps make your job (and your teams’ jobs) much easier. You will notice that we have included initial evaluation planners and evaluation charts for each of the youth age groups between 3 and 14 (pre-evaluations are not necessary for adults unless you choose to do so). When using the class planner, you will score the child on a scale of 1 to 5 based on how well he or she performed. The student must score and average of “3” in order to qualify for the group class; any score below a 3 would be considered a weak spot, and any score above a 3 would be considered a strength. Those students that do not qualify for the group class can either be placed on a personal training program to help them build the necessary skills, or you can provide the parent with some homework suggestions and ask them to come back in 4 to 12 weeks, depending on the situation. This will help you remedy potential classroom distractions commonly associated with pre-mature enrollments of students that are not ready. The following information will take you step-by-step through the entire evaluation process. This will help you conduct the best pre-evaluations possible. We suggest that you practice conducting the pre-evaluations with existing student first in order to have a level of standards to work from. Step 1: Set an appointment to pre-evaluate the prospect. Your first goal is to set an appointment with all new students at a time when one of your instructors is available. Find out whom the person is inquiring information for (child or adult). Ask for the age if the person is a child. Let them know that all of your programs are age-specific and skill-specific to target each participant’s stage of development. Inform them that all students must be pre-qualified in order to determine which program is best for him/ her. Review your trial program (optional), or offer the pre-evaluation for free. Offer 2 dates and times for the pre-evaluation. Ask for their contact information in case you miss connections. Ask them to arrive 10-minutes prior to the appointment. Ask them to call should they have to re-schedule. Refer them to your Website for more information. Have your pre-qualification charts ready when your appointment shows up so that you can review the basic procedures for the pre-evaluation. This will help you establish professionalism immediately. It will also clarify that you are a quality martial arts school. You will increase the value of your program instantly, which will make the enrollment presentation much easier. Tell them that for each category, you will run the child through 3 tasks per category. Explain that for those children that do not qualify, you can put him or her on a private lesson circuit, or provide some at-home assignments and have him/ her come back in 4 to 12-weeks. Explain that the pre-qualification will not only help you determine whether the child will qualify for the group class, but it will also help you spot his/ her strengths and weaknesses which contribute to the design of your class planners. The pre-evaluation can be the key tool to getting the enrollment (pending the person qualifies). In some cases, the percentage of enrollments from the trial lessons to a beginner program is as low as 50%. This percentage will grow dramatically as you master the pre-evaluation session. Break the ice before you get started on the pre-evaluation. I start by asking the child what type of sports he or she plays; what their favorite color is; what their favorite movie is; and if they have a favorite hero. This helps me see the child’s personality and preferences. I use his or her answers during the evaluation as much as I can. Ask the child if he/ she understand what martial arts are about, and if he/ she understand what your particular style includes. This sets the child up for the physical tasks as I explain how each task will make him or her stronger. Run the child through each task, but be patient with their response. Some of the tasks are pushing the envelope just a little bit and may be challenging for the child to perform right away. Look for the emotional and social characteristics during the entire evaluation. You’ll have to skip down the chart and fill in your score for this area as you are ready. I watch to see how many times the child looks over at his or her parents. I also watch to see how excited they get during each task. Most importantly, I evaluate how well he/ she listen and pays attention throughout the evaluation. End with allowing the student to pick out one piece of equipment or target from your target area to play with. This gets him/ her excited about martial arts training. The student shows weakness in this area and needs special attention to ensure proper development. The student shows some skill, but is slightly behind others his or her age. This area will need to be focused on in order for the student to progress. The student shows average skill compared to others his or her age. The student shows strength in skill compared to others his or her age. The student shows exceptional strength compared to others his or her age and could possibly advance through the program at an accelerated pace. In my school, we are proud to say that out of every student that qualified for the group classes, more than 95% join the trial program. The reason why is because we clearly identify each child’s strengths and weaknesses and then translate how our program will target those skills in a results-driven curriculum. To parents, it’s a no-brainer when they see obvious areas that their child can develop and a method for improving those skills. Add up all of the scores on the chart and then calculate the average score. Remember, the child must score an average of 3 or better in order to qualify for the group classes. Make a copy of the chart for the parent. If the child’s average score is lower than 3, explain to the parent that the child has a few weak spots which will limit his/ her development in a group environment; give the recommendation to either put the child in a personal training circuit to build the necessary skills, or provide some at-home suggestions and invite them back in 4 to 12-weeks. If the child’s average score is at 3 or above, congratulate the child and inform the parent that he or she has successfully qualified for the group classes. Review each task and score, and then provide professional comments on how you determined that score. Identify the child’s strengths, which are any tasks in which the child scored a 4 or 5. Explain why the child received that score and how these strengths will enhance his or her performance in class. Identify the child’s weak spots, which are any tasks in which the child scored a 1 or 2. Explain how your program will help target those weak spots and help the child build better skills in those particular areas. If the child didn’t score lower than a 3 on his or her chart, explain how their child has at or above-average skills in all 4 categories which means he or she will do well in the program and possibly be one of the top students in class. Once you are complete with the evaluation, proceed to cover the program options. You can turn over this portion to your program director if you have one. I personally like to hand them over to my office manager, who is always prepared to present the programs and terms. 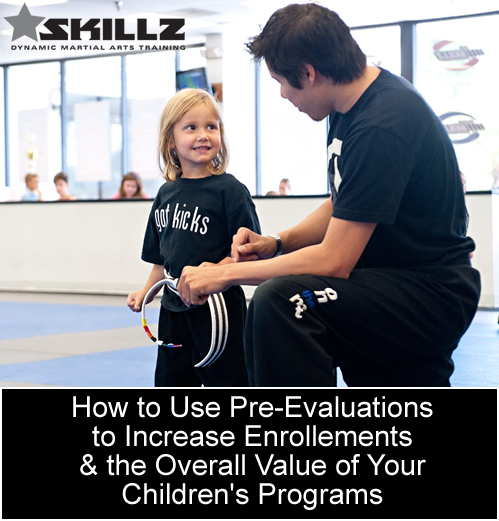 Email me at melodyshuman@skillzconnect.com for my basic pre-evaluation files. *Licensed SKILLZ schools have access to the “skills-based” pre-evaluations that coordinate with the curriculum. If you are a Rainmaker client, you also get access to the SKILLZ pre-evaluation app. You do not have to accept every person into your school right away; and you do not have to lose them if they do not qualify either. By creating some pre-qualification standards, and then helping children meet your standards, you will add more value to your program than imagined. These standards will help increase retention, generate referrals, and make classes more enjoyable to teach. Establishing initial standards will also increase your school’s reputation. People admire businesses that operate with higher standards. If you are ready to take your intro lesson to the next level, then using the pre-evaluations will do the trick.